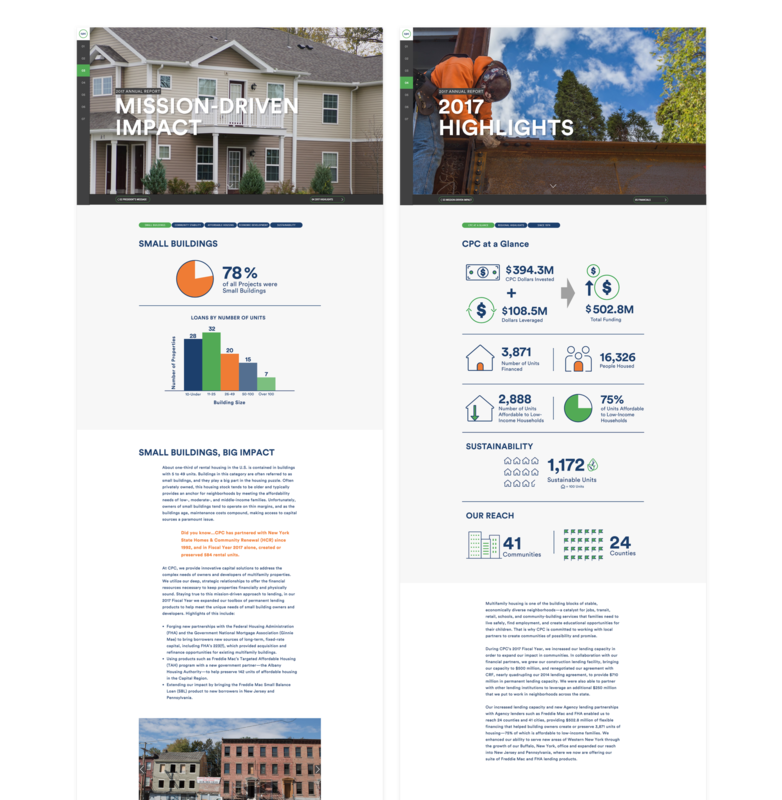 Moving an annual report online — and engaging stakeholders with a bold, mission-inspired solution. 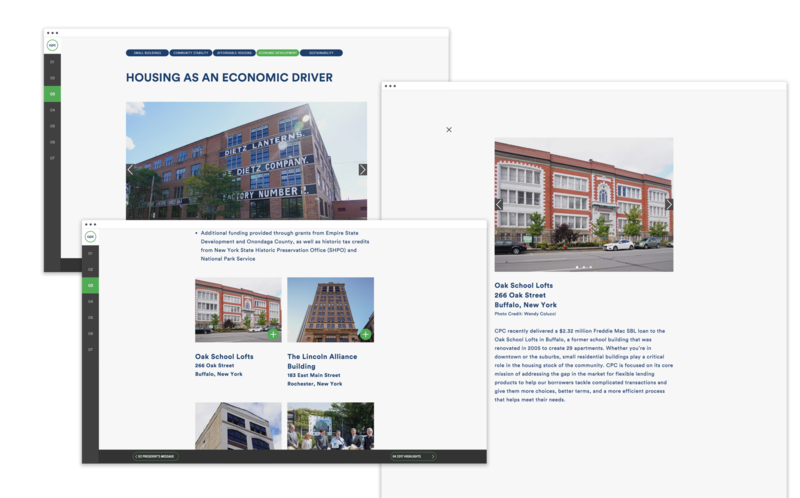 Seeking to bring fresh energy to its 2017 annual report, the Community Preservation Corporation (CPC) invited Suka to create a dynamic, interactive online solution. The organization expressed a desire for a highly intuitive design solution and charged Suka with creating an engaging online report tailored to the organization’s constituencies. The Suka team began by exploring the impact the Community Preservation Corporation has had on people and communities across New York. Inspired by the organization’s deep commitment to transforming underserved neighborhoods into thriving communities, the Suka team conceived a bold, photography-driven approach to telling CPC’s 2017 story. View the annual report site here. 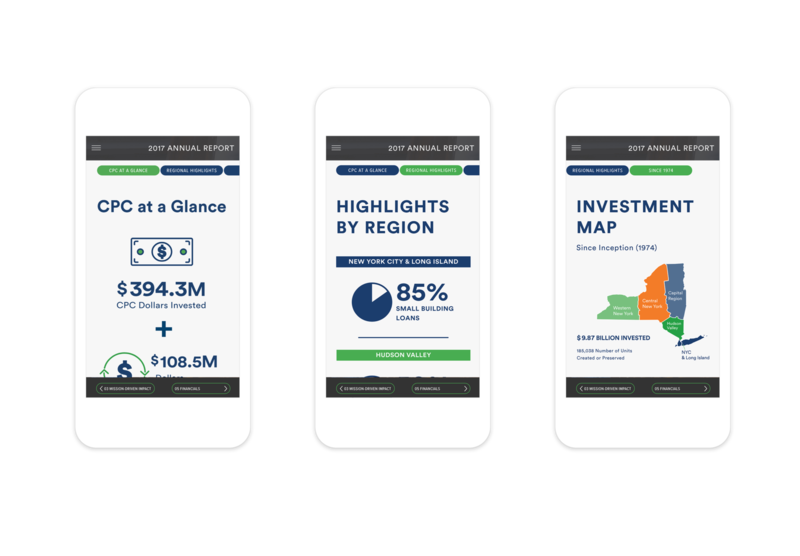 With CPC fully engaged at each step of the process, we designed a report that leveraged full-screen imagery, bold headlines, and an innovative navigation scheme that allowed users to browse through the report in multiple ways. The navigation marked out “chapters” in the report, allowing viewers to read the report like an online book. 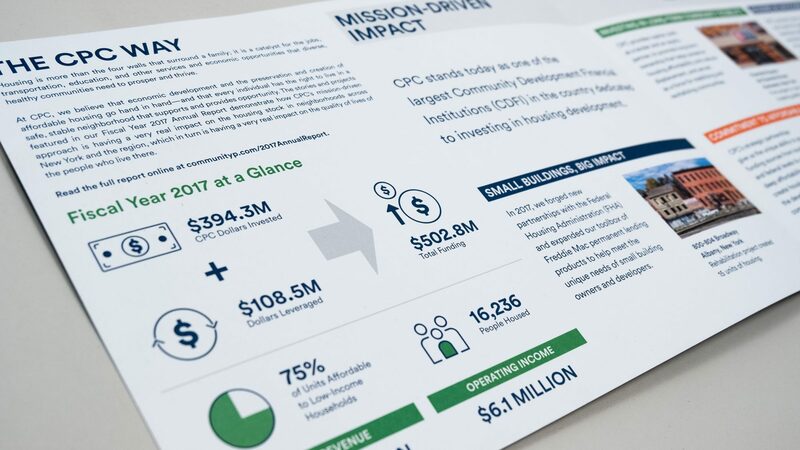 We also worked to bring energy to the financials with animated infographics that elevated the aesthetic presentation and provided evidence of CPC’s mission in action. Our solution moved the report beyond just a financial accounting of the year to an inspired experience grounded in CPC’s mission and hard-hitting achievements. In addition, we created a short, 4-page printed “teaser” with highlights from the year to draw stakeholders to view the full report online. 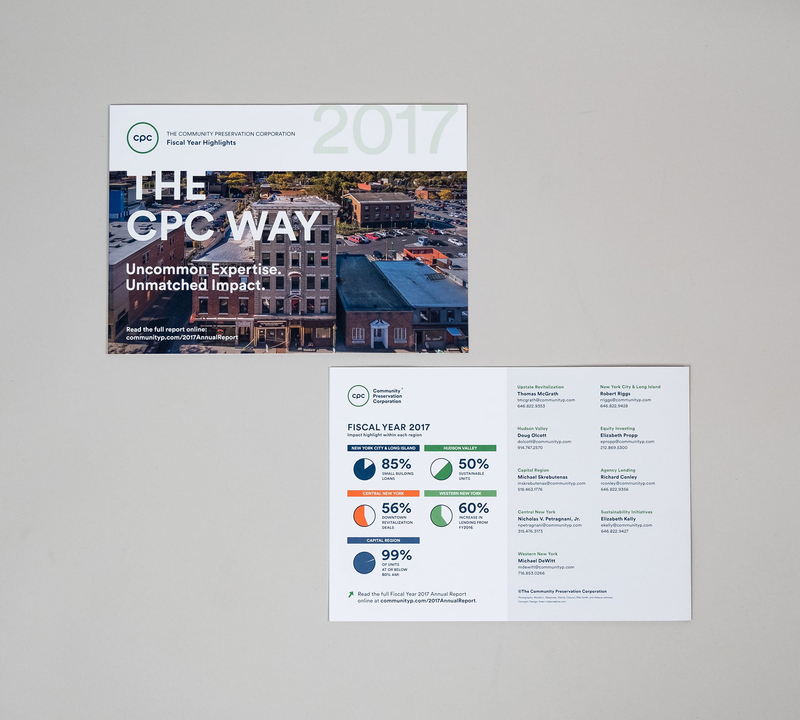 The 2017 annual report was a definitive step forward for CPC communications; an interactive report that modernized the way the organization engages its stakeholders. The annual report was well received by all audiences, including older supporters accustomed to printed publications. With its full-bleed photography, impactful use of type, and intuitive navigation, the report created deeper engagement within its communities, reached new audiences, and positioned CPC as an innovative, progressive organization.